In 2061, the world was forever changed when a massive alien artifact simply appeared near Jupiter, bringing with it an electromagnetic storm that disrupted and corrupted much of Earth’s technological progress. Named Thunder, both for its heralding of the storm and the “noise” it generated along the spectrum, this enigmatic object remained there, patient and inscrutable for decades. Thirty years after Thunder’s appearance, we’ve finally developed technology capable of withstanding the static, and are ready, at long last, to explore the secrets it holds and represents. For Thunder is nothing less than an artificial wormhole, a portal leading to another section of the galaxy, maybe even the universe, altogether. A door has been opened, and it’s time for humanity to step through. Taria Spears is an anthropologist obsessed with Thunder and what lies beyond. She’s secured herself a much-coveted spot on the Lightbringer, the ship which will seek out the origin of Thunder, at the expense of her relationships and much to the dismay of the military personnel on board who distrust all civilians. Come what may, she’ll pursue her destiny, no matter what it takes her or what it makes of her. 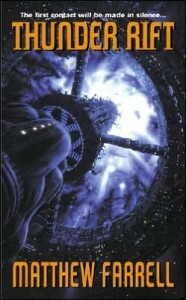 Much to their surprise, the crew of the Lightbringer indeed find an intelligent race on the other side of the wormhole. Superstitious, complex, living in complete silence and incapable of speech as we know it, they’re nowhere near sophisticated enough to have created Thunder. The search for the “Builders” must continue. But Taria feels differently, and ultimately ends up alone among the Blues, who call themselves the Children-of-She-Who-Spoke-the-World. As she delves deeper into the mysteries of their faith and history, she’ll come face to face with her insecurities, her flaws, and her reason for living. Will she be the only person capable of making peace between the humans of the Lightbringer, the Children, and the other, unfathomably powerful, inhabitants of this alien world? And what sacrifices will she make along the way? Thunder Rift is a superb example of a first contact novel where the aliens are truly alien, yet constructed along logical lines. Taria is flawed, but sympathetic, the sort of person who’s always looking for something and never sure she’s found it. My only complaint would have to be the gradual change in tone of the story from science and exploration to an almost metaphysical transcendence. Whatever’s going on near the end isn’t playing by any rules I’m familiar with, and in some ways, it made me uncomfortable, but in a good way. I was reminded, however briefly, of the 2001 saga, and the left turns that took along the way. However, after being immersed in the exotic culture of the Blues, I found the ending of the story to be somewhat disconcerting in its execution. That flaw aside, Thunder Rift is a good start, and it’s a sure thing we’ll be seeing more from Matthew Farrell.